Is Hiding Your LinkedIn Connections a Good Move? How Do You Look on the LinkedIn Mobile App? Is Your LinkedIn Profile Helping Your Competitors? Are You Ignoring the Right People on LinkedIn? 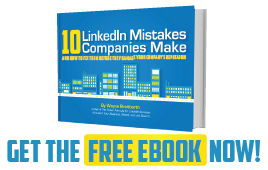 Are You Spending Enough Time on LinkedIn to Get Results? Do You Want to Know the Top 2 Reasons to Use LinkedIn?